The authorities in Pakistan have detained two senior police officers accused of negligence in the 2007 killing of former PM Benazir Bhutto. Rawalpindi's former police chief Saud Aziz and another top official, Khurram Shahzad Warraich, were remanded in custody after being denied bail. They are due to appear in court on 7 January, police say. The men deny failing to protect Ms Bhutto, who died in a gun and bomb attack at a Rawalpindi election rally. Prosecutors say the police officers were also responsible for the hosing down of the crime scene, thereby destroying key evidence. A UN report released in April said the killing could have been prevented. The report accused Pakistani authorities of severely hampering the investigation and said no credible inquiry should rule out the possibility of involvement of members of the country's military and security establishment. The UN inquiry also criticised the decision to hose down the crime scene, and said the failure to collect and preserve evidence "inflicted irreparable damage to the investigation". 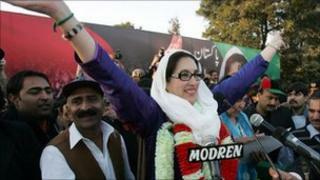 Five suspected militants are already facing trial for alleged involvement in Ms Bhutto's murder. A Pakistani government investigation blamed the then top leader of the Taliban in Pakistan, Baitullah Mehsud. He denied being involved in the assassination and was killed in a suspected US missile attack in August 2009.